Join biologist and field guide, Jason Fidorra, for a presentation of photos and stories from birding in Borneo. On a recent independent trip, Fidorra traveled in search of birds and wildlife of the world’s 3rd largest Island. 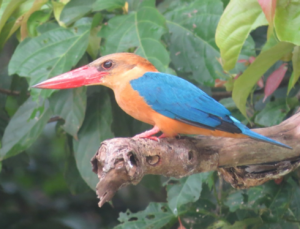 Famous for Orangutans and Elephants, Borneo hosts amazing mammals, but is equally famous for bird life including many endemic species and even an entire family of bird found nowhere else on earth. Jason currently works as a biologist in Tri-cities with WDFW. He has led tropical birding trips to Central America, and has spent over a decade working on bird research and conservation projects in North America and the Caribbean. Admission: Season ticket holders are given seating priority. Individual concert tickets will be available at the door when space is available for Adults ($25) and Students ($10). Johnny and Chris Rice are Polish-American musicians. Each plays the piano and each the cello. they have performed extensively from coast to coast in the United States, including Carnegie Hall, and Internationally. Each has been a Chopin Gold Medalist. they feature a blend of classical music, Gospel, jazz, ragtime, and Boogie Woogie. Thursday, Friday & Saturday at 7 p.m. and Saturday at 2 p.m.
Join The Rude Mechanicals in their current production of Shakespeare’s Hamlet. One of Shakespeare’s most famous plays and often quoted in popular culture, Hamlet is the tale of Denmark’s grieving prince who seeks to avenge his father’s murder by bringing the new king, Claudius (his uncle and his mother’s new husband) to justice. 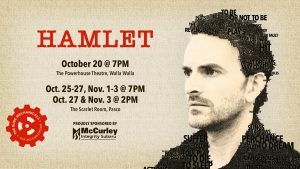 Hamlet vividly portrays the power of overwhelming grief and rage while exploring themes of treachery, revenge, and moral corruption. From 6:00 p.m. – 8:30 p.m.
Other vendors include: Tri-Cities Astronomy Club & A Stroke of Genius Facepainting. Special thanks to partner US Fish & Wildlife for providing skulls, pelts, and owl pellets for dissection! 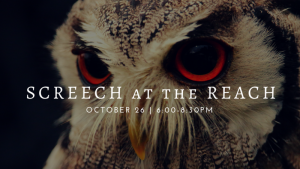 Feel free to come dressed in your Halloween costume but remember to wear comfortable shoes for the REACH Night Hike. No candy will be distributed this evening but there will be insect tasting! Anyone hungry for some crickets? Friday from 12 Noon – 6:00 p.m.
Come join us for our semiannual bazaar! With items ranging anywhere from information on Celebrate Recovery® to gifts for Christmas! Lots of handcrafted, one-of-a-kind items. Or, order a customized item from one of our talented seamstresses. The cafe will be open with biscuits & gravy, soup & sandwiches and brownies fresh from the oven! Hike up Badger Mountain in costume for healthy goodies along the way. After the hike stick around to enjoy the Harvest Party which includes games and activities for the whole family to enjoy. Every year, the Saturday before Halloween we put on a fun, family Halloween event with our very own YMCA healthy twist. 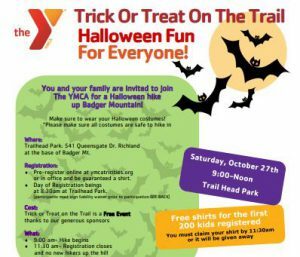 Families who join us for Trick-or-Treat on the Trail will enjoy an exciting family hike up Badger Mountain while dressed up in their favorite costumes! Children of all ages trick-or-treat for healthy goodies along the trail. After the Halloween hike, families stick around to enjoy our Harvest Party which includes games and activities for the whole family to enjoy! This is a Free event made possible by community sponsors. Calling all Superheroes, Villains, Zombies, Pirates, Mermaids, Ghosts and Goblins. 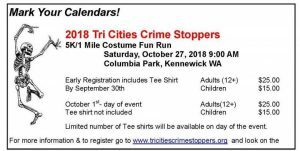 Show off your best Halloween costume and take part in this years Tri-Cities Crime Stoppers Halloween 5K/1 Mile Fun Run. 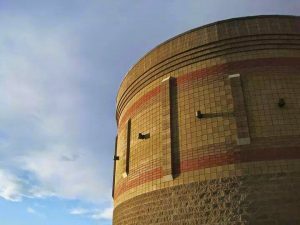 The run starts at 9 a.m. at Columbia Park in Kennewick and goes along the Columbia River. You don’t have to wear a costume — but why wouldn’t you — especially with a costume contest at the end! Registration fee: $20, Kids under 12 may attend for free (no registration required for kids). Adopt Shelter Animal Pets (ASAP) is hosting the 4th Annual 5K Howl-O-Ween Walk for the Animals. We will also have a raffle, pre-sales of our ASAP and Capital City Dolls – Tri-Cities 2019 Calendars, and be sharing information on animal rescue in the Tri-Cities. Proceeds help provide essential care for the lost and abandoned animals of West Richland, the Tri-Cities and Yakima. Please join our lodge for a free, fun, family event showcasing the arts, crafts, stories, music and culture of Scandinavia. Featuring: Cultural Displays, Cooking Demonstrations, Genealogy Research, Baked Goods, and Musicians – Coffee & Vafler Booth open all day. Viking sundaes, traditional soups, lefse, and cookies will be served beginning at 10:00 a.m.
From 10 a.m. – 9 p.m.
Free and all ages welcome to attend! 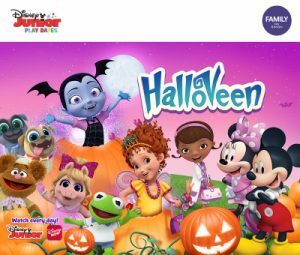 From 11 a.m. – 1 p.m.
Disney JR. Vamperina will be bringing some spook-tastic fun to Columbia Center Mall this Halloween! Stop by the Center Court from 11 a.m. – 1 p.m. for crafts and games – kids can come in costume. 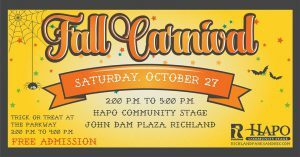 From 2 p.m. – 5 p.m.
Join us at John Dam Plaza for this year’s annual Fall Carnival! 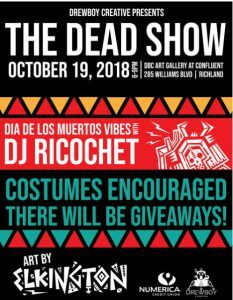 There will be games, prizes, live entertainment, and a costume contest! Also, Trick-or-Treat will be taking place at the Parkway from 2 p.m. – 4 p.m.
Our last home bout of the season! Church of Atom will take on Quad Forsaken from Spokane at 4:45 p.m. and at 6:45 p.m. (approx) The “Gorey” Ladies of ACRG will battle it out against the “Glittery” Girls of Rodeo City out of Ellensburg. 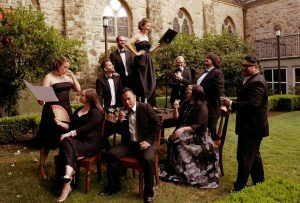 The Byrd Ensemble, directed by Markdavin Obenza, is a Seattle-based professional ensemble made up of 10 to 12 singers. Tickets: $14 general admission, $12 for seniors & students (available in advance at The Bookworm in Kennewick and Octopus’ Garden in Richland, or at the door. Anyone not familiar with the music of Bill Staines is in for a special treat. 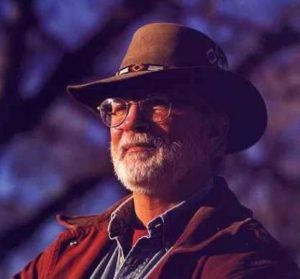 For more than forty years, Bill has traveled back and forth across North America, singing his songs and delighting audiences at festivals, folksong societies, colleges, concerts, clubs, and coffeehouses. Bill’s music is a slice of Americana, reflecting with the same ease his feelings about the prairie people of the Midwest or the adventurers of the Yukon, the on-the-road truckers, or the everyday workers that make up this land. Trick-or-treat adult style is on the marquee at the Princess Theatre in Prosser for our tenth straight year this Halloween. The ticket includes admission to the movie, props bag and pre-show parties at 7 p.m. and 10:30 p.m. in the theatre’s adjoining Green Room. 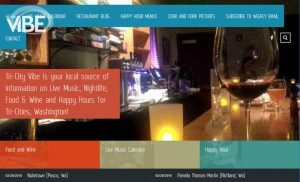 The tenth annual parties include music, Halloween treats, a trivia contest, a no-host bar with local wines and microbrews available by the glass, and a “Time Warp Costume Contest” after 7:30 p.m. and 11:30 p.m. The Rocky Horror Picture Show is not a horror film; it is a rock-musical send-up of old science-fiction and horror films. Originally a stage play, the movie was released in 1975, and has become a cult classic interactive experience. More information about the movie is at http://www.rockyhorror.com. 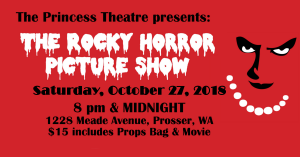 As part of the RHPS experience, attendees are encouraged to dress up in costumes, yell back lines at the movie and act out the film with a bag of props. Due to theatre policy, attendees will not be permitted to bring their own props into the theatre. The $15 ticket includes a props kit with the script, bubbles, newspaper, toast and more. First-time RHPS attendees are traditionally referred to as “virgins.” Training/refresher sessions for the interactive portions of the film will begin at 7:45 p.m. and 11:45 p.m.
Purchase tickets online or in person at Adventures Underground in Richland and at the Theatre’s office. 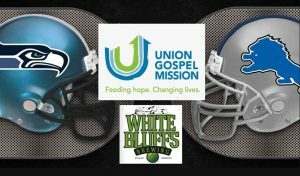 From 9:30 a.m. – 1:30 p.m.
Join us starting at 9.30 a.m. for Detroit Lions vs Seattle Seahawks at the taproom & enjoy some breakfast with us benefiting the Tri-Cities Union Gospel Mission! All proceeds from your breakfast is donated and what better way to have fun & help someone?! On the menu is scrambled eggs, biscuits, sausage gravy, hashbrowns, & pancakes. We will also have your favorite brews & mimosas available for purchase. $1 OFF your first beer if you make an additional cash donation. 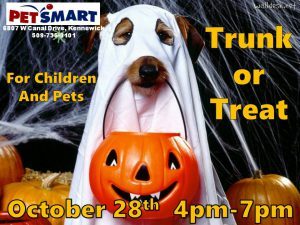 PetSmart will be hosting a Trunk or Treat and Charity Carnival. Lots of great trunks from local businesses and individuals. Some trunks will also have fun kids activities. A local rescue is hosting a carnival to raise money to help support their rescue operation. The cost to attend is by donation. All pets attending must be on a leash at all times and should be properly vaccinated. The event is still welcoming people to join them and host a trunk for the event, please contact PetSmart if you would like to host a trunk. From 4:30 p.m. – 6 p.m. 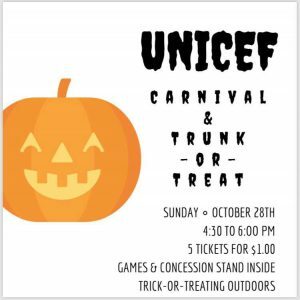 The middle and high school youth group at Kennewick First United Methodist Church is putting on a UNICEF Carnival and Trunk-or-Treat for children and families in our community. This is a carnival that Kennewick First has been putting on for over 35 years. It includes games and a concession stand inside (5 tickets for $1), and free Trunk-or-Treating outside. All proceeds go to UNICEF, United Nations International Children’s Emergency Fund. Please come in your costume and invite your friends! EBCHS (East Benton County Historical Society) and HIHO (Hands In Hands On) join forces to bring an exciting, traveling children’s museum exhibit to the Tri-Cities! This pretend trek across the U.S.A. features an activity for every state and the District of Columbia – ride a mule in the Grand Canyon, celebrate New Year’s Eve in Times Square, hit a home run at Fenway Park and guide your sled dog team on the Iditarod Trail, to name just a few! More than 70 hands-on learning opportunities address key academic standards for school-age visitors and highlight our nation’s geography, history, music, pastimes and iconic tourist destinations. Hundreds of U.S. trivia questions at interactive game stations encourage a little friendly competition among trivia buffs of all ages. 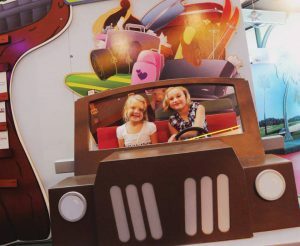 Photo murals feature of some America’s most beautiful and iconic destinations and lots of fun facts. Trivial Pursuit®: A 50-State Adventure exhibit was created by the Betty Brinn Children’s Museum in collaboration with Hasbro, Inc. Trivial Pursuit® is a trademark of Hasbro and is used with permission. 1981, 2015 Hasbro, Pawtucket, RI 02861-1059 USA. All Rights Reserved. Here is a list of corn mazes, pumpkin patches, fall festivals, haunted houses & forests to check out around the Tri-Cities region that are taking place through the end of October 2018. Local muralist, Heidi Elkington, is featured in a new art show that explores themes of life and death and the celebration of both. 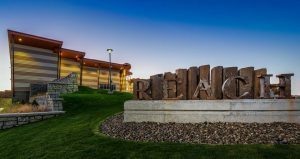 Heidi is an artist who loves living and working in Tri-Cities. She paints in a variety of mediums, including acrylics, oils, and watercolor on canvas, wood, metal, and on buildings. 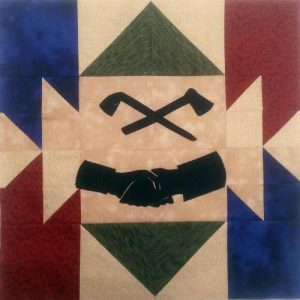 This exhibit includes a collection of quilt blocks designed to tell the story of the Corps of Discovery as they searched for a continuous water route across the continent. Lewis & Clark’s mission was to map the entire route and record as much data as they could about the flora, fauna and native peoples on their journey. Baskets and Native American artifacts complete the exhibit. Tuesday through Friday: 10:00 a.m. – 5:30 p.m. 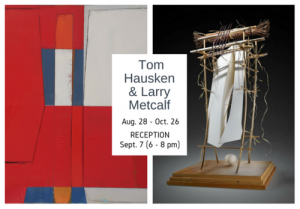 Throughout September and October, the Gallery at the Park will showcase Tom Hausken and Larry Metcalf’s exhibit “Working Through It – 35 Years.” The title of the show, “Working Through It,” refers to the idea that working is a constant part of an artist’s life. Artists are always working and creating, regardless of what life throws at them. 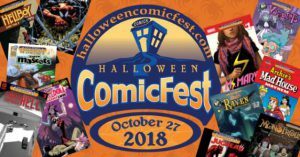 – October 26: Supervolcanoes at 7 p.m. and Stars of the Pharaohs at 8 p.m.
– October 27: The Zula Patrol: Under the Weather at 2 p.m. and The Little Star That Could at 3 p.m.